« I Love You Beary Much! Hello and welcome to Stop #22 on Stampin’ Addicts Holiday Mini Catalog Blog Hop! Whether this is your last stop or your first, I hope you are enjoying the hop. I am lucky enough to feature the Build-a-Bear Big Shot Dies! Not only does Stampin’ Up have a fabulous partnership with Sizzix, producing exclusive dies for the Big Shot, but they have recently partnered with Build-a-Bear Workshop as well! Putting these three companies together has produced amazing results. 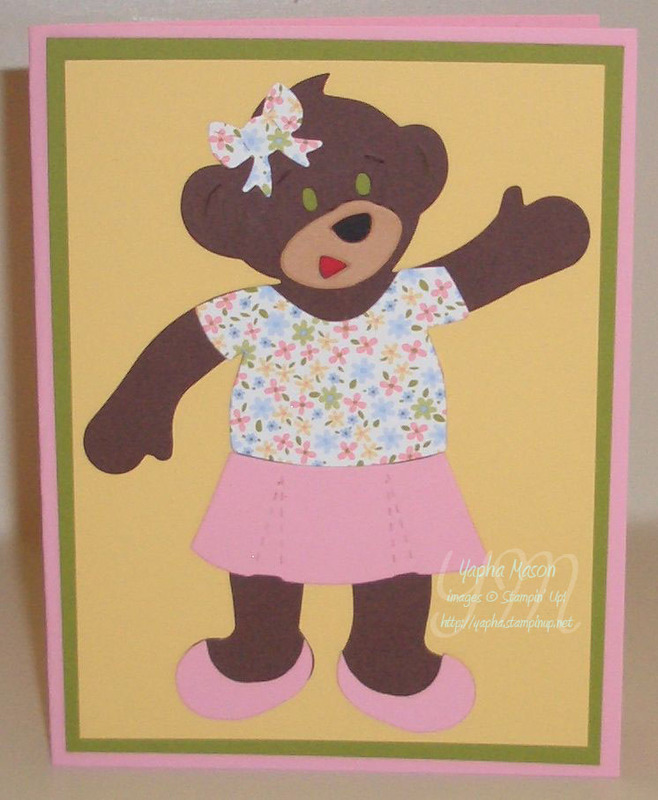 Of course, these super cute bears can be cut out of paper and used on cards or as fabulous scrapbook page embellishments. There is a great new pack of Designer Series Paper in the Mini catalog, Pawsitively Prints, that is fabulous for bear clothes among other things. I made two quick and easy cards. Now I need to print off all my pictures of Eve at Build-a-Bear Workshop and scrapbook them with these cuties. The final project I have to show you for this hop is a super cute Halloween project. Since the Bigz Dies are able to cut through several layers of cardstock, I folded a piece to cut out each of these bears. the fold is hidden under the hats, and allows the bears to stand up by themselves and to be opened as shaped cards. These can be super cute invitations for a Halloween Party, or to hold Halloween treats inside or in their paws. I hope you enjoyed this stop on the Stampin’ Addicts Holiday Mini Blog Hop! The Holiday Mini Catalog will be available beginning Tuesday, September 1st. Please be sure to visit the previous stop, Barbara’s Creative Stampin’ Spot, and the next stop, Tracy’s Stamp Therapy. Yapha, great job on your little bears! 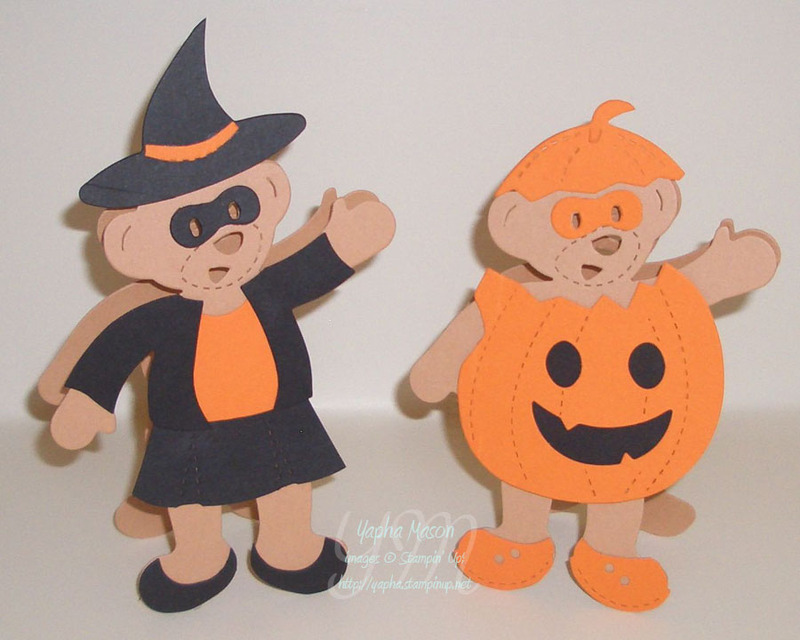 I especially love those Halloween bear cards – I am sold! These are all just so adorable and I love how you stood them up. Fantastic projects – I know that so many kids are going to just love getting their hands on these adorable little bears. TFS!!!! Wonderful job, Yapha! You’ve made me *need* those dies! I love it all but especially those halloween bear cards. Genius! Thanks Yapha for another great blog hop! These are so cute! I keep telling myself that I need to ‘find’ some small children so I can justify buying these for myself! TFS! Your bears are great. I think I am going to have to break down and get these. Love the folded bear idea – very nice work – it looks like you had fun creating all these! Yapha, everything you did is so beary cute!! Great idea to fold the bears so that they stand up. Hmmmmm. . .what else can I fold and cram in the Big Shot? Lol! Tell Eve she did a fabulous job with the felt! Yapha tell Eve she did a great job! I love what you did my fav. was your last bears! I love how you made them into a card. Great idea! Great projects!!! Oh my goodness, Eve must be having a ball with these bears–who could resist them? 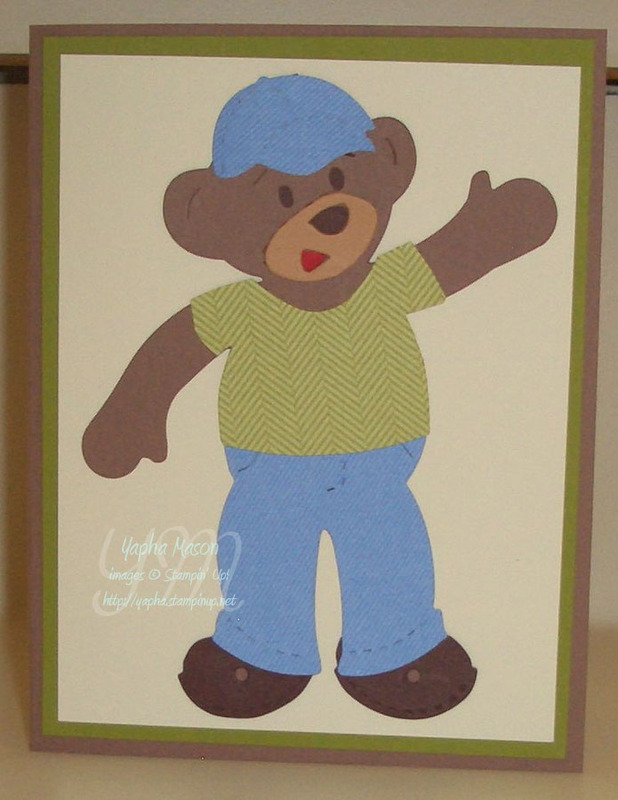 I especially love the bear card with the fold hdden under the hat–the ultimate party invitation for sure! Great projects with the Build-A-Bear dies Yapha, I’m sure Eve is having a wonderful time playing with her new “toys” (what girl wouldn’t!). I love your idea of the stand-up bear cards, they turned out amazing and adorable! So so so so SO cute!!! The Halloween ones are pure genius! Good job showing off the bears – on top of moving cross country! Great idea making the bears stand up by themselves! Oh gracious… I was so not going to buy into this line…. I foresee a small business loan in my future and it is all Yapha’s fault!!! Wow Yapha! We are making the felt bears too! I’m getting the wood sheets to make a base for them, but I love your background setting! and those cards are TOO CUTE!! I love the option to fold and double cut on the dies, and I didn’t even think about using it with the bears! So cute! Thanks for all your hard work on the hop, Yapha. You rock, sistah! Love all the cute bears you created. Thanks for all you did to make the blog tour possible. Once again you and SA and all the tour gang pulled off an incredible level of creativity and inspiration as well as a very fun tour of the new Holiday Mini. This group never disappoints. Kudo’s to you all for the work that went into putting this on for the enjoyment of all. I’ve posted all the links on my blog and newsletter so others can come back and glory in the mojolicious loveliness over and over again! Yahpha, these are so cute! So much for me resisting buying them. . . . . Great ideas! So cute!!! I love the bear cut with the fold at the top! Super cute ideas! 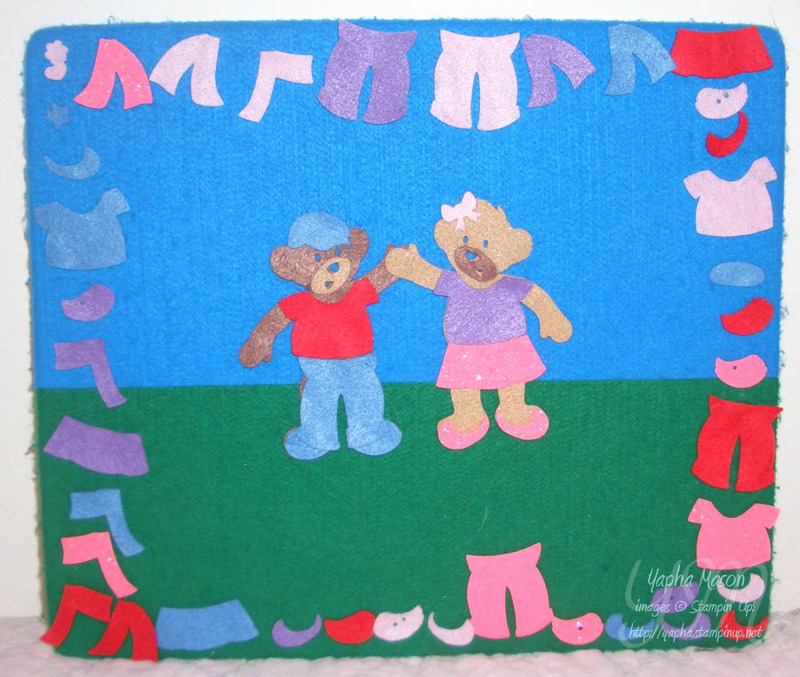 Love the idea of the felt bears to play with! A Positive Place To Be! Learn more about the Big Shot! Click to Subscribe for Email Updates! All content, including text, photographs and projects are © Yapha Mason. My artwork is shared for your personal enjoyment and inspiration only and is not intended for submission to contests, publication or for personal monetary gain.